(2) Preferred Stock. Ten Million (10,000,000) shares of Preferred Stock having a par value of $0.001 per share (the “Preferred Stock”). All capital stock when issued shall be fully paid and nonassessable. No holder of shares of stock of this Corporation is entitled as such to any pre-emptive or preferential rights to subscribe to any unissued stock or any other securities which the Corporation may now or hereafter issue. (1) Number of Shares. The Common Stock shall consist of Two Hundred and Fifty Million (250,000,000) shares. (2) Voting. Except as provided in these Articles of Incorporation or by applicable law, each holder of Common Stock is entitled to one vote for each share of Common Stock held of record on all matters as to which Common Stockholders are entitled to vote, which voting rights shall not be cumulative in any election of Directors. (3) Other Rights. Each share of Common Stock issued and outstanding shall be identical in all respects with each other such share, and no dividends shall be paid on any shares of Common Stock unless the same dividend is paid on all shares of Common Stock outstanding at the time of such payment. Except for and subject to those rights expressly granted to the holders of Preferred Stock and except as may be provided by the laws of the State of Nevada, the Common Stockholders shall have all other rights of stockholders. 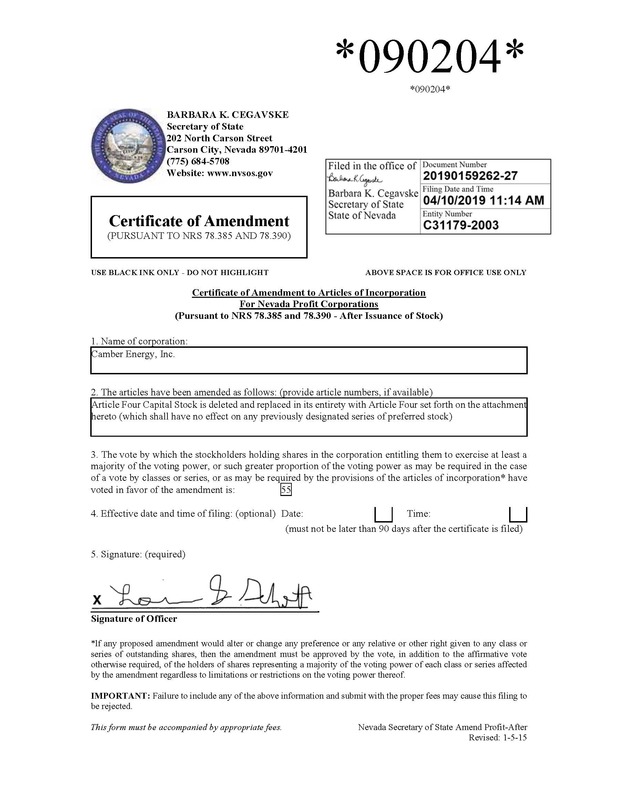 (12) Any other powers, preferences and relative, participating, optional and other special rights, and any qualifications, limitations and restrictions thereof, insofar as they are not inconsistent with the provisions of the Articles of Incorporation of this Corporation, to the full extent permitted by the laws of the State of Nevada. The powers, preferences and relative, participating, optional and other special rights of each class or series of Preferred Stock, and the qualifications, limitations or restrictions thereof, if any, may differ from those of any and all other series at any time outstanding.